Brett Michael Kavanaugh (born February 12, 1965 in Washington D.C. ) is a Circuit Judge of the United States Court of Appeals for the District of Columbia Circuit. He was Staff Secretary in the Executive Office of the President of the United States under President George W. Bush. Kavanaugh played a major role in drafting the Kenneth Starr report, which urged the impeachment of President Bill Clinton. You can read it online via the L. A. Times website, but it dwells heavily on his extra martial affair with Miss Monica Lewinsky, and rather minimizes the real issue for the impeachment proceedings which was his lying under oath to a grand jury (perjury) and obstruction of justice; the Democratic Senate acquitted Clinton on all accounts and he was not removed from office. While the Sagittarius ascendant is odd for a man born and raised in D.C., the centaur also represents the law, administration & education and in those arenas, Judge Kavanaugh is commanding. His specialty is administrative law, he coaches the Catholic Youth Organization basketball teams and donates pro bono legal work to the organization as well. This is a speculative chart nonetheless but the aspects between his natal and his Scotus appointment date have some interesting references. His ascendant is 24 Sagittarius, the blue bird of happiness, that alights at the door symbolizing good luck, happiness and abundance. It is the degree of unexpected assistance and has the keyword of Fortune. Kavanaugh has Jupiter in Taurus in the fifth house suggesting that he would have several girls, he has two and with Saturn in the second house, he is a serious minded man and not prone to frivolities like the late Judge Scalia. even though both are Splash temperament types. 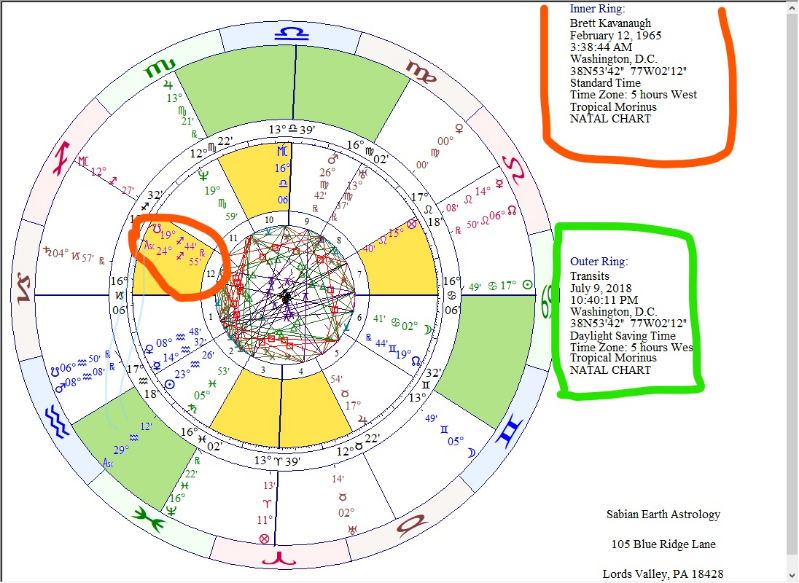 His yod between Neptune in the eleventh and Pluto make a point at his fourth house cusp so that the “head” of the yod (Pluto and Neptune are its arms) is the midheaven at 16.06 Libra suggesting that this is fulfilling a life’s dream. E.C. Matthews says that this degree is populated with people on both sides of the law: Winston Churchill and Jesse James giving its native a practical but inventive mind.